Rihanna boldly opened up about losing her virginity as she posed for one of her most gorgeous magazine shoots yet. 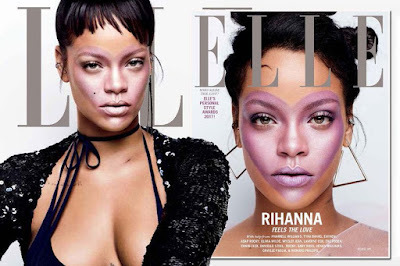 Wearing a lilac heart emblazoned across her face, Ri slipped her curves into a plunging bikini top to grace the cover of Elle magazine's October issue. The megastar was interviewed by some of her famous friends for the magazine including Tyra Banks, Eminem, April Bloomfield, Zac Posen and Pharrell Williams. And when asked where she would go if she could time travel to anywhere in the world, the Bad Girl had an unusual answer. Magician David Copperfield asked: "I'm not kidding, this is a real offer: I can make you disappear and reappear anywhere in the world. Where do you want to go, and why?" She answered: "Ten minutes before I lost my virginity…and I'm holding you to that offer. LOL." » This Semi-virgin Is Asking If She Should Give Her Boyfriend Her "remaining Virginity"